It is time to turn the limelight to the cousin of Ginger, the Galangal. You might have heard that Ginger and Galangal look somewhat similar, that both are widely used in Thai, Indonesian, and Malaysian Cuisines, and that they have similar flavor profiles so that they can be substituted for each other. Well, only two of these affirmations are accurate. Want to know which ones? Keep reading! Galangal is an aromatic rhizome (a subterranean plant stem, much like Turmeric and Ginger) that belongs to the Zingiberaceae family. There are four types of Galangal: Chinese ginger, greater galangal, sand ginger, and lesser galangal. These differ in size, color, and taste. Greater Galangal has an orange or brown skin and pale yellow-white interior. Its taste is more subtle than Lesser Galangal’s and is most commonly used in Thai and Indonesian dishes because it doesn’t overpower the preparations. They might look similar, but when it comes to taste and aroma, Galangal and Ginger are miles apart from each other. In her book, Hot Thai Kitchen, Chef and Author, Pailin Chongchitnant stresses that Galangal has much more of a cooling aroma, almost like menthol, (think more like pine needles, and not so much Vapo Rub) it is spicy and has a ‘woodsy’ after taste, while ginger can be slightly sweet and more peppery. Other main difference between Galangal and ginger is its use; galangal’s flesh is much stronger, so it can’t be grated like Ginger; instead, it must be sliced. Whenever you use it in your preparations you must take it out before plating; it has a fibrous texture that is not pleasant when chewed with the rest of the components of the plate. So, Galangal and Ginger are not interchangeable, how can you use it? You could have tasted Galangal many times, but you might not know it. Its flavor is the base for numerous Thai, Indonesian, and Malaysian dishes. And now that you know what the secret ingredient is, you can recreate them in your home. Need a starting point? Here are some flavorful and easy recipes to start discovering the wonders of Galangal. Beef rendang is a popular dish in Indonesia and Malaysia, and it’s no wonder because this dish is exquisite. A hint of tang in this rich, savory, thick sauce coats your tongue even as the tender meat falls apart in your mouth. 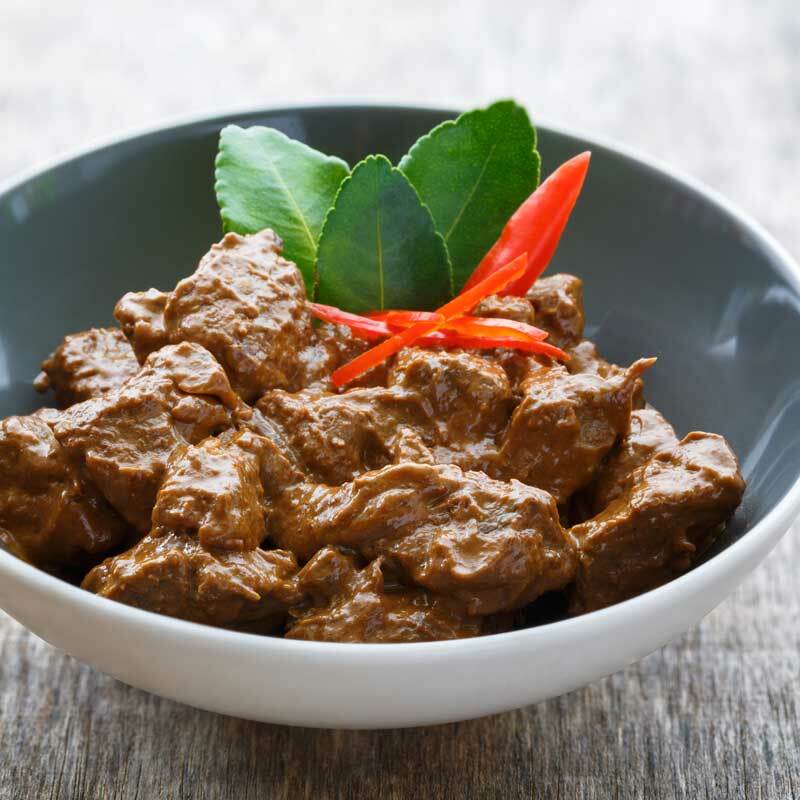 The beef is slow cooked in coconut milk and a wealth of spices until all the liquid has been reduced to a thick saucy coating that erupts in your mouth with flavor; this Beef Rendang sauce is so good all by itself, you may want to make it on its own and spoon it over rice or pasta. 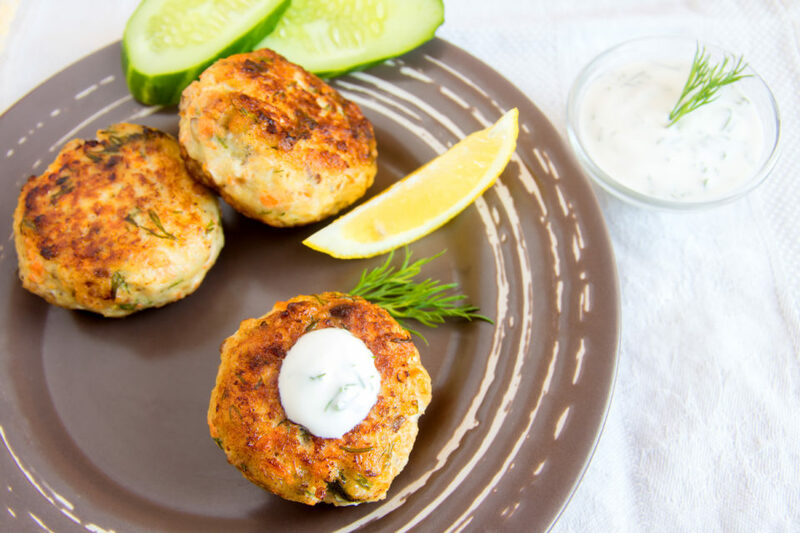 This Thai Fish Cakes recipe will transport you in one bite to your favorite Thai restaurant, or even better to the streets of Bangkok. It’s bold flavors and silky texture will have you in love with this recipe in a heartbeat. This savory spice goes well with a variety of foods, including beef, chicken, pork, but is a great pairing with seafood. 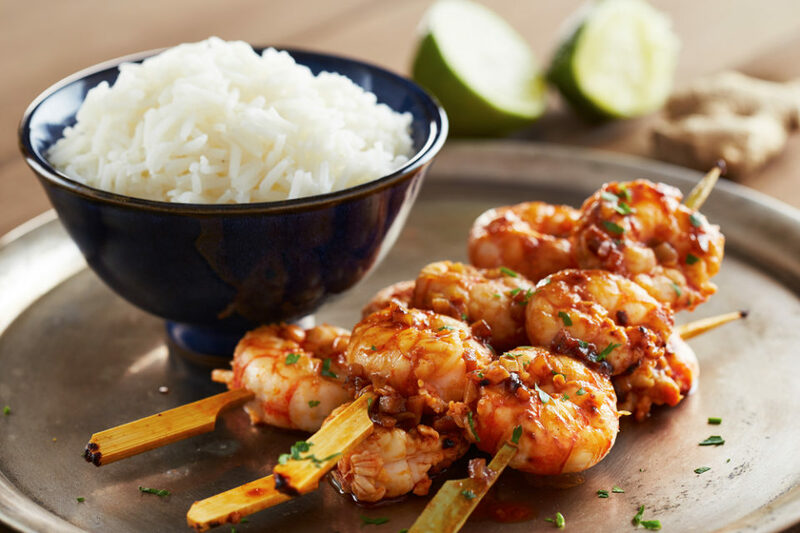 Add chili peppers, cilantro, coconut milk, garlic, lemongrass, and lime and you’ll have the perfect Shrimp Skewers. Now that you learned all about this amazing spice, do you know where to buy it? Look no further! All of Galangal’s magic is just a click away. In Burma Spice, we source our Galangal roots from the tropical climates of Indonesia and Thailand. They are harvested during the early winter months so they don’t rot. Once the harvesting season is over, they are sold and shipped fresh, dried, and powdered. They are shipped to the U.S by crates that are temperature controlled to ensure freshness. Once they have arrived on the docks of our ocean, the Greater Galangal roots are ready to be added to your Thai dishes for exquisite flavor. Buy all of its presentations here! Burma Spice Tip: To hydrate your dry Galangal submerge it in lukewarm water for 10 minutes before using it in your preparations. What else can you do with Galangal? …. Cocktails! You can have the taste of Southeast Asia in a glass, isn’t that amazing? Give these cocktails a try, they’ll turn you in the expert mixologist of your dinner party! Thai Gin Sour: What’s not to like in a Gin Sour? This exotic drink will give you spice, zing, and freshness in every sip. Find the recipe here. Tom Yum Cocktail: This cocktail, inspired by Tom Yum Soup, has all the primary flavors: spicy, sweet, sour and spicy. With vodka, sugar syrup, lime juice, lemon grass, and red chillis its the perfect exotic drink for a fun night with friends. Find the recipe here. Pattaya Margarita: Summer is almost here! This is the perfect cocktail to chill by the pool, inspired in Southeast Asia Flavors. Expert mixologists! We dare you to try this one. Find the recipe here.